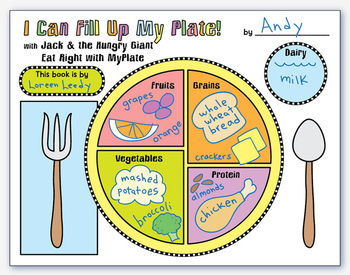 MyPlate is the nutrition education program that has taken the place of the USDA's Food Pyramid. 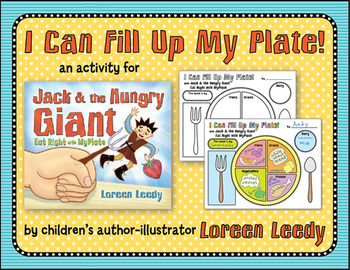 My picture book, Jack & the Hungry Giant Eat Right with MyPlate, provides a kid-friendly introduction to MyPlate. Like the traditional fairy tale, Jack climbs up the beanstalk and enters the giant's castle. The giant scoops him up, says "I'm hungry!" so the terrified Jack makes a dive for it. The giant catches him and in a departure from the original tale, advises him to be careful. Waldorf turns out to be a nice giant as well as a wonderful chef who is delighted to invite Jack to enjoy a healthy meal. The full color artwork has large illustrations of the fruits, vegetables, and other foods as they’re being prepared. For more info about the book, please see this post on my blog. Here are more resources related to Books! Click here to see all my Writing resources. 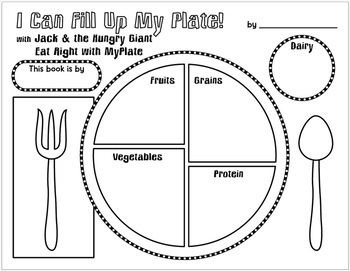 Enjoy, and please leave feedback if you found this activity useful. Thank you!